Like most blogs, websites, radiostations, etc, For The Love Of Music also has it's song of the week. It's called Love Of The Week and will enter our Top40 the next week, or, sometimes already charted a couple of weeks. 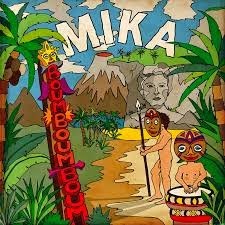 After Belgian Stromae paved the way for French lyrics in tophits for the last two years, it's now time for Mika. After his very very very succesfull debut in 2007 the hits dried up a bit. His 2nd and 3rd album were good, but no real radiohits, even a collaboration with Pharrell Williams couldn't match the succes of his first hits. Now it's time for a new shot at succes for the Lebanese- Brittish singer. In French this time, like he did before in "Elle Me Dit". "Boum Boum Boum" is not his best song, but it's good for summer and singing along with the chorus. Our Love Of The Week for the week starting July 5th.